Santa Fe is home to more than 250 galleries and hundreds of artists, architects and craftspeople. It is the second or third largest art market in the United States behind New York, and nearly tied with San Francisco. In 2005 the United Nations Educational, Scientific and Cultural Organization (UNESCO) honored Santa Fe with its worldwide “Creative City” designation, the first and only one in the United States. Art is now such a natural part of the look and feel and fame of Santa Fe, it’s astonishing to realize that this 400 year-old city’s reputation for art is less than 90 years old. Of course, there have been artists in Santa Fe as long as there have been people here. The city sits atop the ruin of a thousand year-old Indian pueblo where women made pottery in the Anasazi / Tewa tradition; an art that continues to the present day in the surrounding pueblos. Spanish settlers brought their folk art traditions of carved and painted religious images, called bultos and santos, as well as skill in blanket weaving, furniture making, blacksmithing, and tinwork. Classically trained painters first visited Santa Fe in the mid-nineteenth century as members of exploration or survey parties. Their number included such notables as John Mix Stanley and Worthington Whittredge, but they all had art careers in the east, and none considered making even an extended stay in this dusty little frontier town. Toward the end of the nineteenth century, another generation of artists came west to draw illustrations for stories in east coast magazines or advertisements for the new western railroads. Taos eventually managed to snag a few of these artists as permanent residents, including Joseph Henry Sharp and Oscar Berninghaus, but none of them seemed to have much of a fever for Santa Fe. Three optimistic souls actually did attempt to make their living as painters in Santa Fe before the turn of the last century. In 1886, Mr. and Mrs. Harold Elderkin set up a gallery and taught painting to local residents, but within two years they decamped to the apparently more art-loving town of El Paso. A Mr. George Stanley tried his luck at a similar enterprise in 1897 but was gone a year later. From the point of view of east coast Anglo culture, Santa Fe looked like a backwater in 1900, but by the early 1920s it boasted a thriving, nationally-known art colony. What had changed to bring about this sudden flowering of the arts? One factor was that artists were finding new aesthetic and professional reasons to live and paint in Santa Fe. 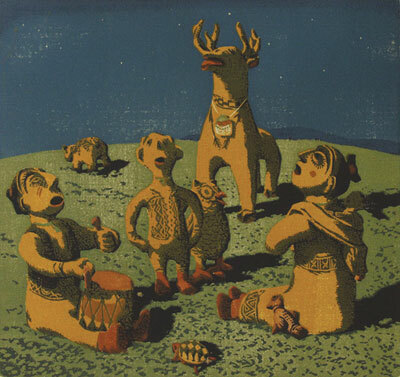 Some artists wanted fresh, new subject matter and were fascinated with the local Native and Hispanic peoples and their exotic rituals, crafts, and dwellings. 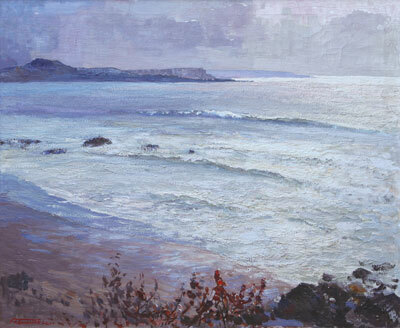 Most artists also loved the clear, sharp light of the southwest and the way it played on a relatively unspoiled landscape. Some saw the isolation of Santa Fe as a bohemian escape from the strictures of east coast society. Still others came to New Mexico with hope of curing their respiratory ailments, but stayed because they had fallen in love with everything else about Santa Fe. After the turn of the century, professional artists also found it more economically feasible to live and work in Santa Fe. 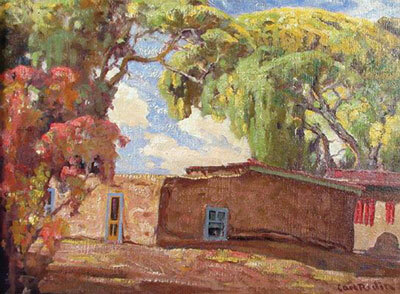 Whereas the Elderkins and George Stanley had tried to earn a living solely among the small population of Santa Fe, members of the new art colony had a broader base of support, selling most of their paintings in cities on the east or west coast. They built their art careers before arriving in Santa Fe and were “colonists” in the literal sense: they settled in Santa Fe to make use of the local resources but maintained their economic ties to the metropolitan art markets from which they had emigrated. Economics, however, cannot wholly account for the rise of the art colony. In great measure, this new generation of artists stayed because the people and institutions of Santa Fe made greater efforts to encourage and support them. Ironically, this new local support of Anglo-American artists was mostly a by product of a larger effort to culturally revitalize Santa Fe by preserving and promoting its Hispanic and Native architecture as a draw for tourism. The main player in this effort was the newly formed Museum of New Mexico. Museum staff realized that high-profile artists could play a useful role in their preservation efforts and actively solicited their participation. The Anglo artists happened to be in the right place at the right time, and they worked hard to make the best of their happy circumstances. Revitalizing Santa Fe had been on townspeople’s minds since 1880 when the Santa Fe Railway bypassed its namesake, and the town stared a slow decline. By 1900, it was sadly apparent that Santa Fe not only was losing much of the industry and commerce that the railroad could bring, but it also was missing the rapidly growing tourist trade. Well-heeled travelers came west in ever large numbers to see the region’s natural wonders, but also to temporarily escape the city and sample a quieter, older, and more exotic way of life. Some influential local citizens felt that Santa Fe’s best hope to cultivate tourism lay in its adobe architecture, its traditional Hispanic culture (most residents spoke Spanish), and its proximity to Indian pueblos. It was just the exotic escape visitors were looking for. Among the citizens most taken with the idea were anthropologists who had been excavating prehistoric ruins in the region and documenting the rituals and artifacts of the existing pueblos. Their unofficial leaders were a politically savvy educator and amateur archaeologist, Edgar Lee Hewett, and his patron, Frank Springer, a wealthy lawyer, businessman, and Territorial Senator. In 1907 Hewett persuaded the eastern backers of the School of American Archaeology to locate their field school in Santa Fe. In 1909, they persuaded the legislature to found the Museum of New Mexico as an adjunct to the School, and Hewett became the first director of both institutions. To house them, the territory donated the disused Palace of the Governors on the Santa Fe Plaza, a move that probably saved the 300 year-old building from demolition. Theodore Van Soelen, Gerald Cassidy, Will Shuster. With government support and a staff of energetic young archaeologists, Hewett, Springer and their allies set out to document, preserve, and promote Santa Fe’s adobe architecture. In 1912, museum staff photographed dozens of Spanish and Mexican-era adobe buildings in an effort to define a New Mexico-style of architecture. Their interest, however, was not limited to old buildings. The larger part of their agenda was to codify the local style in order to promote its use in new buildings. Attracting tourists, they felt, was not just a matter of preserving what was left of old Santa Fe. It also would be necessary to create a modern adaptation of the old style that would give the town a distinct brand identity. That style would incorporate elements of both Pueblo and Spanish buildings including adobe construction, flat roofs with canales, viga and latilla ceilings, and casement windows. “Santa Fe Style” was born. 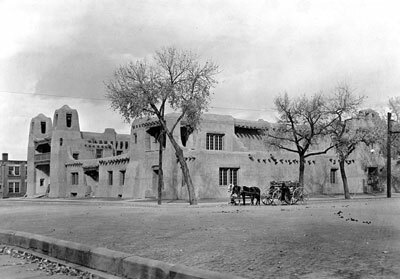 To publicize the Planning Board’s recommendations, the museum staged a “New-Old Santa Fe Exhibit” featuring drawings, photographs, and models of new and old adobe buildings, including the restoration plan for the Palace of the Governors which replaced a territorial-era façade with its current New-Old style portal in 1913. Even before restoration of the Palace of the Governors was complete, the ever-ambitious Hewett complained that the museum’s collections soon would outgrow the building. What happened in those intervening three years was the founding of the Santa Fe Art Colony. The first of the colony’s members, Carlos Vierra, arrived from New York in 1904 and joined the staff of the Museum of New Mexico soon after it was founded. Warren Rollins showed up from California five years later and stayed for short periods. Sheldon Parsons and Paul Burlin arrived from New York in 1913. With the addition of Gerald Cassidy from Chicago by 1915, Santa Fe finally could claim to a community of accomplished, professional artists. Members of the colony gravitated to the museum and to Hewett’s circle of friends because they generally shared the same fascination for the history and cultures of New Mexico. As an educator, Hewett also had a genuine interest in promoting all types of cultural activities and, conveniently enough, his patron, Frank Springer, was an enthusiastic art collector. Hewett’s interest in promoting the art colony was undoubtedly sincere, yet he also knew that artists could help him promote his new museum and his crusade to remake Santa Fe as an adobe-built tourist destination. The paintings they sent to their galleries on the coasts were romantic evocations of Santa Fe’s Hispanic and Pueblo cultures. Their audiences were well to do art patrons who also were potential tourists – if the paintings inspired them enough. The presence of the artists in Santa Fe was an attraction in itself, and visitors would drop by the studios to view and purchase work, since there were no commercial galleries in town. Hewett’s best public relations maneuver on the behalf of the art colony was helping to bring the renowned painter, Robert Henri, to Santa Fe during the summers of 1916 and 1917. Frank Springer personally put up half of the $60,000 price tag, and Hewett hired the local firm of Rapp, Rapp and Hendrickson to design the building in what was then being called the “Santa Fe Mission” or “Spanish-Pueblo” style, incorporating replicas of several different Pueblo mission churches into the façade. 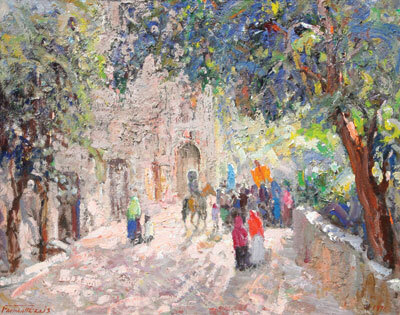 When the museum opened in November 1917, more than 2000 people attended dedication ceremonies and the inaugural exhibition of New Mexico art which included the work of dozens of painters including most members of the Taos art colony as well as virtually all of Santa Fe’s professional artists. As a show of appreciation and support, many of the artists donated their paintings to the museum where they still comprise its core collection. 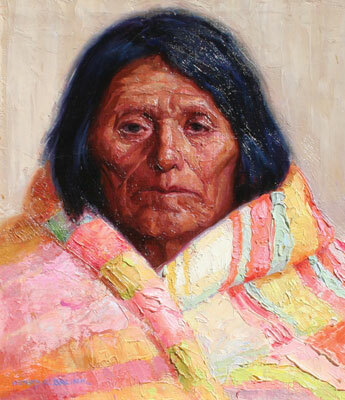 By the late ‘teens, successful artists were arriving in Santa Fe in growing numbers. Some came as summer visitors, enjoying the landscape and climate for a few weeks or months before returning to their studios and classrooms in the east. In 1917 George Bellows and Leon Kroll accompanied Robert Henri to Santa Fe after hearing his glowing reports. In 1919, the renowned modernist painters Marsden Hartley, John Sloan, and Randall Davey arrived in town to paint and relax for a few months. Sloan would spend the next 30 summers in Santa Fe, painting in a small studio on Garcia Street and inviting famous artist friends such as Stuart Davis for periodic visits. Davey was so enthralled by his first visit that he returned in 1920, bought a large property at the top of Canyon Road, and made Santa Fe his permanent home. Other established artists who settled down in Santa Fe in the years during and after World War I included William P. Henderson who brought his wife, Alice, to the Sunmount Sanitorium in 1916. On the train out from Chicago they met the ex-patriot painter, Julius Rolshoven, who had returned to the US to escape the war in Italy. Two years later, Henderson invited his friend, B.J.O. 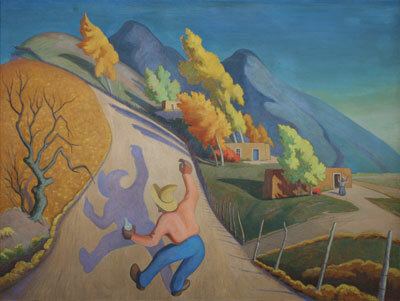 Nordefldt, for a visit and Nordfeldt spent most of the next 20 years painting in Santa Fe. Olive Rush bought her Canyon Road house in 1920, Andrew Dasburg bought land on Camino del Monte Sol in 1921, and Frank Applegate moved in next door in 1922. That same year, Albert Schmidt moved to Tesuque, just north of Santa Fe, and asked W. P. Henderson to design and build his house. Gustave Baumann and Henry Balink built homes on Old Santa Fe Trail in 1923. Raymond Jonson, the influential abstract artist and teacher, moved to town in 1924. 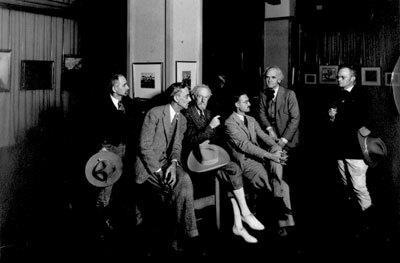 Evidence that the art colony in Santa Fe was starting to mature in the 1920s was the rise of formal clubs or societies devoted to promoting and selling the work of the town’s professional artists. Will Shuster arrived a short time later, and by 1921 they were joined by Walter Mruk, Joseph Bakos, and Willard Nash. 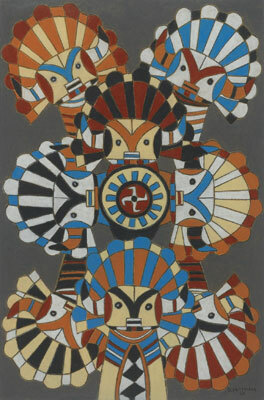 It is important to note that Los Cinco Pintores were the first professional artists in Santa Fe who had not established significant reputations elsewhere. All five were still in their 20s and came to Santa Fe to learn from the better known artists already in the colony. Shuster had been a student of John Sloan in New York and the two remained friends until Sloan’s death in 1951. Albert Schmidt also provided support and encouragement to the Los Cinco Pintores and, no doubt, was exactly the type of teacher they sought. Born in Chicago, Schmidt studied at the Chicago Art Institute and later the Academie Julien in Paris. 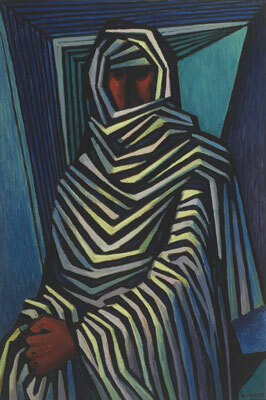 Even as a young man, he exhibited his work at both institutions as well as the 1915 Panama-Pacific exhibition in San Francisco. The museum also continued to encourage and support the new arrivals; both those visiting and those who came to settle permanently. When John Sloan and Randall Davey arrived for their first visit, Edgar Hewett immediately set them up in studios in the new building, just as he would do for countless others. Art services offered by the museum included assistance with framing, and with building crates for shipping paintings. 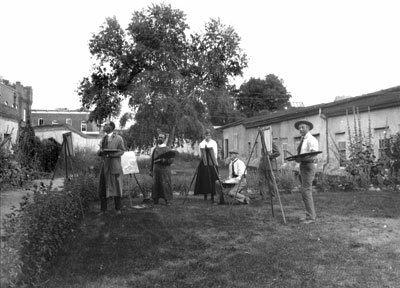 Artists also enjoyed the assistance of the museum’s photographer in recording their paintings, and use of the darkroom for their own photo projects. Hewett had an etching press set up for the artists in the basement, and he even had periodic artist dinners catered in the boardroom for a nominal charge. Exhibitions in the new museum of fine arts were the most important service provided to the artists since the paintings on display also were for sale. From its inception through 1950, the museum had an “open” or unjuried exhibition policy in which no artists were turned away. This was a great boon to emerging artists such as Los Cinco Pintores (who had their first group show in 1921,) but the policy also found favor with nationally prominent artists such as John Sloan who thought it was refreshingly democratic and a welcome departure from the stuffy practices of eastern art academies. In addition to the annual exhibition of Santa Fe artists, the museum developed a busy schedule of group shows, thematic exhibits, and one-person shows. Among the artists’ favorites were “Alcove Shows” which featured a small number of new works by an individual local artist. As late as the 1950s, the museum staged memorial exhibitions to posthumously honor members of the Santa Fe Art Colony. The symbiotic relationship between artists and museum was deep and lasting, and ultimately very productive as a driver of tourism in Santa Fe. The museum gave the artists practical assistance and the artists gave the town national visibility. Together, in the span of 20 years, they gave the town a reputation as one of America’s great art colonies. Since the 1960s, the plethora of commercial galleries in Santa Fe has taken over much of the sales and support roles that made the Museum of Fine Arts so important to early members of the colony. At the same time, the museum has broadened the scope if its exhibitions. Nevertheless, the art destination you see today is the direct result of the civic pride, historical awareness, and spirit of cooperation that first made an art colony possible in Santa Fe. This article was excerpted from Canyon Road Arts: The Complete Visitors Guide to Arts, Dining and Santa Fe Lifestyle, Vol 3, 2007-2008, pages 56-65. Canyon Road Arts is published by Medicine Man Gallery. All rights reserved.